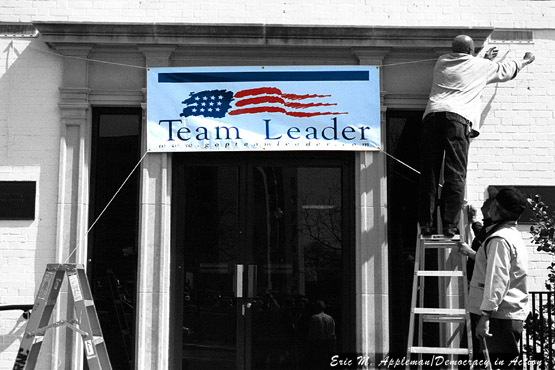 March 25, 2002--Workers put a banner for the Republican National Committee's Team Leader program on front of the party headquarters building in Washington, DC. RNC chairman Marc Racicot announced the launch of a new website, www.gopteamleader.com. This program developed out of George W. Bush's 2000 presidential campaign. The RNC organized more than 95 team leader recruitment events in 2001, some targeted at specific constituences such as Hispanics and African Americans. By March 20, 2002 there were more than 90,000 team leaders across the country.